Electric cars were largely novelties until Tesla introduced its Roadster in 2008. Now, a few small start-ups are trying to repeat Tesla’s success in another sector of the electric vehicle industry. They’re building trucks, hoping to sell them en masse to government and business fleets. A prototype of EV Fleet's Condor, which the company demonstrated during a demo day. 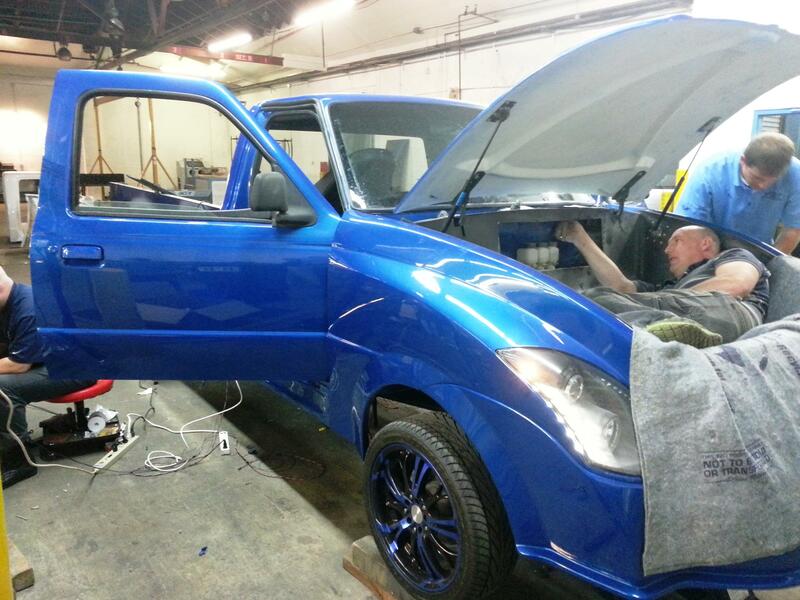 The truck bed's paint will match the rest of the car in final versions, the company says. Inside a warehouse at Reventure Park on the edge of Charlotte, mechanics tighten bolts and glue insulation on a shiny blue pickup truck. They are putting the finishing touches on the Condor, getting it ready for its debut to possible buyers. 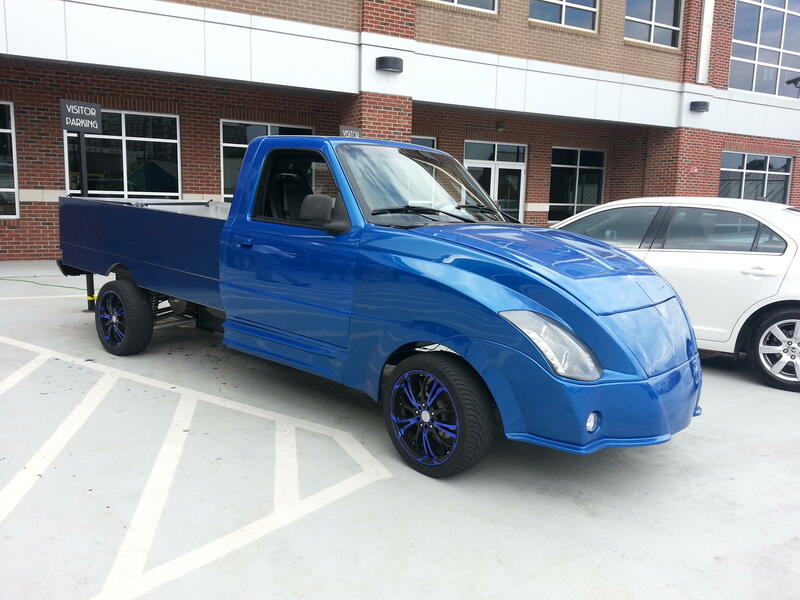 The all-electric truck features smooth lines and no grill, to cut down on drag. 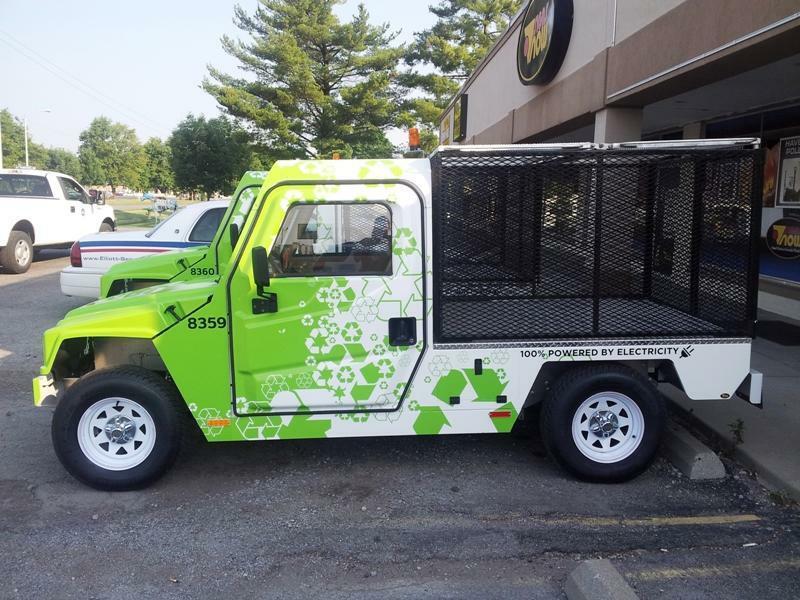 While running on electricity may not be odd for a car these days, trucks need more power for hauling and no standard electric truck option exists in the U.S. Brooks Agnew founded EV Fleet to create one. The idea, Agnew says, is to compete to replace the very popular, but decommissioned Ford Ranger in public and private fleets. It would be easy to dismiss the lofty claims. Among other things, Agnew has spent years trying to organize an expedition to the North Pole to see if the earth is hollow. And, EV Fleet has had several iterations under different names. But, Agnew has decades of automotive experience, and, most of all, the truck works, zipping smoothly around South End all day during its demo. Several fleet managers attended the demo and had positive reviews. “I've done some research into it. As far as I can tell the truck looks pretty solid, and that’s why we’re looking into it,” says Chris Facente, who manages UNC Charlotte’s more than 400 vehicles. Other representatives attended from the state, the City of Charlotte, and Duke Energy. Facente already has about 100 electric vehicles in his fleet—mostly the low-speed, golf-cart sized GEMs, which staff use to travel the campus and carry very light deliveries. “The novelty’s really going out of the electric vehicle. It’s going to be here to stay in the right applications,” Facente says. He says it makes sense to use them, but only for jobs they have the power to do, without worry the battery will run out. “When they used to build cars they used to have to build a vehicle that could survive in Anchorage, Alaska and Death Valley, California. And now things are going more toward a specialty,” Facente says. UNC Charlotte is also considering the smaller e-ride, a low-speed vehicle--certified to drive speeds up to 35 mph--to replace some of its Ford Rangers. The university will soon need to replace its aging Ford Rangers, but that is a big step up for electric technology. There are a few options: the Condor, a converted full-size truck from Utah-based VIA Motors, or perhaps Minnesota-based e-ride’s low-speed vehicle, which looks like a cross between a Jeep and a golf cart. Last week, Facente test drove an e-ride around campus, and he plans to try the Condor this week. Or, he could stick with a gas or diesel Ford F150, which would certainly be safer than buying a $50,000 truck from EV-Fleet’s 13-man shop. “The concern would be parts replacement more than anything. Will this truck have enough parts where I can get parts?” Facente says. If the company goes out of business, so do their custom parts. Add to that, most public organizations buy from government-approved vendors, which makes it tough for newcomers to break in. EV Fleet mechanics work to prepare the truck for its demo. The space under the hood serves as a trunk. Electric cars are a growing part of vehicle fleets—Charlotte began buying Nissan Leafs and Chevy Volts two years ago, but those are products of the major automakers. Some corporations like Staples and FedEx have converted some of their delivery trucks, but overall electrics make up an immeasurably small fraction of the six million trucks in U.S. fleets. “Eventually there will be a crossover point,” says Travis Bradford (no relation), the director of Columbia University’s Energy and Environment program. “Long term this is where we’re headed, from a pure economics point of view. But, in the meantime, the only way to get there is to see the industry tested and scaled up to allow that to happen. And that is where we are right now, Bradford says. Fleets are testing the water, but not buying big. Of course, it took one small company to jumpstart the electric car industry. Maybe EV Fleet will do the same for trucks.